SECOND-HALF strikes from substitutes Josh Scowen and Tomer Hemed saw Rangers come from two goals down to earn a gritty point at the KCOM Stadium. 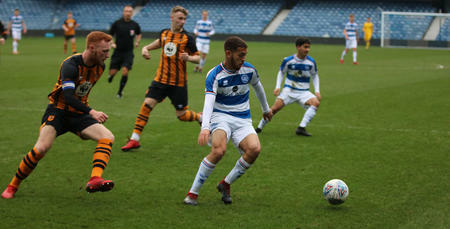 Despite competing in the first half, QPR were 2-0 down at half-time after Kamil Grosicki twice teed up Jarrod Bowen to score for hosts Hull City (minutes seven and 44). But the R’s battled back after the break to take a share of the spoils. First Scowen was on target in rather-fortuitous circumstances in the 62nd minute, before the midfielder did well to provide the assist for Hemed to equalise in the 84th. After Wednesday’s disappointing home defeat at the hands of Rotherham United, Rangers boss Steve McClaren made three changes to his starting XI for the trip to Hull. Geoff Cameron made his eagerly-awaited return from a three-month injury layoff, while there were also starts for Pawel Wszolek and Nahki Wells. Jordan Cousins, Bright Osayi-Samuel and Hemed all dropped down to the subs’ bench. The R’s lined up in a 4-4-1-1 formation: Joe Lumley; Darnell Furlong, Toni Leistner (captain), Joel Lynch, Jake Bidwell; Wszolek, Massimo Luongo, Cameron, Luke Freeman; Ebere Eze; Wells. On a wet and windy afternoon on Humberside, Hull worked a decent chance in the fifth minute. Jackson Irvine slipped in Bowen, whose low 10-yard effort forced a smart one-handed save from Lumley. But the home winger wouldn’t pass on his next opportunity, opening the scoring just two minutes later. Hull worked the ball from left to right, with Grosicki eventually picking out Bowen on the far side of the box. In truth, the latter was probably in too much space as he cut the ball back onto his preferred left foot and hammered home from 12 yards. A disastrous start for the R’s but, after Wells drove into the side-netting in the ninth minute, McClaren’s men almost levelled matters in the 13th – Bidwell shooting marginally past the foot of the right-hand post from 14 yards, after latching onto Eze’s pass. Rangers provided a decent response to falling behind. In the 17th minute, Freeman led a breakaway before finding Wells, who was denied by only a last-ditch intervention. Then after Cameron headed wide in the 20th minute, Freeman drove into the arms of home goalkeeper David Marshall in the 23rd following another tidy passage of play. Clear chances didn’t flow quite as much thereafter, but the R’s did survive when the ball pinballed around the visiting penalty area in the 36th minute – eventually managing to clear the danger. However, Hull would add a second goal on the stroke of half-time – Grosicki and Bowen again combining with devastating effect. Bowen did well to take control of Grosicki’s lofted ball in from the left and, when he subsequently cut the ball back past Cameron on the right-hand side of the box, the winger buried a low effort into the opposite corner. Rangers hadn’t exactly performed badly in the opening period – but their defensive frailties now looked set to lead to a 10th Sky Bet Championship defeat in 14. 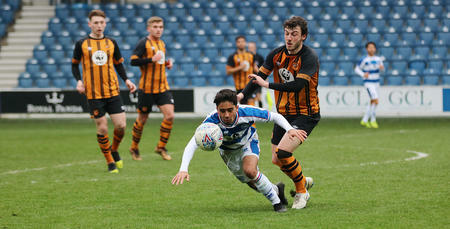 QPR made a change at the break, with Freeman – who looked to pick up a knock in the first half – replaced by Osayi-Samuel. The R’s sub was heavily involved when the visitors carved out the first real opportunity of the second half – leading a counter attack that eventually ended with Luongo prodding over Wszolek’s cross-shot. Two minutes later, more good work from Osayi-Samuel saw the former Blackpool man burst past his marker down the left, before his pull-back was cleared. Rangers just about survived another scare in the 59th minute – Lynch clearing off the line from Fraizer Campbell, who reacted first when Bowen first scuffed his box attempt. The Hoops then halved the two-goal deficit in the 62nd minute. Rangers’ opening goal of the contest admittedly had an element of fortune about it – not that Scowen, who replaced a tiring Cameron seven minutes earlier, would have cared. The midfielder’s low pass, seemingly intended for Wells in the box, actually evaded everyone – and a wrong-footed Marshall could only watch the ball trickle into the bottom left-hand corner. 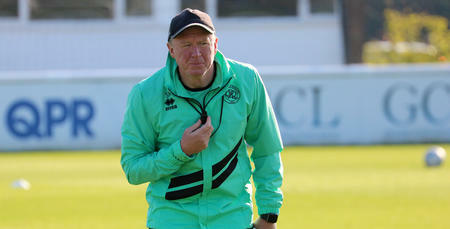 QPR had a lifeline, but could they now complete the comeback? Fourteen minutes from time, determined play from Wszolek led to Scowen crossing low for Wells, before his turn and shot was blocked for a corner. Then from the resultant set-piece, Scowen was denied a second goal when his effort was headed off the line by Reece Burke. In the 78th minute, Lumley denied Bowen his hat-trick after saving the attacker’s low 10-yard effort with his legs. Rangers used their final sub a minute later, as Wells made way for Hemed. It was the latter who earned the R’s a point six minutes before the end of normal time. Scowen did well to keep Luongo’s long ball forward in play, hooking the ball across goal from the right-hand byline before Hemed poked home at the second attempt from close range.